Whether you are seeking your first round, or evaluating additional capital requirements; securing the best and correct amount of external funding is challenging. You can get through the funding process faster, and better by taking advantage of DaggerBoard Advisors Hierarchy of Institutional Financing (HIFin™) Assessment. Do you ever wonder why some companies succeed in their funding efforts while others never seem to get completed? Now you can assess your company's funding readiness against key success factors. 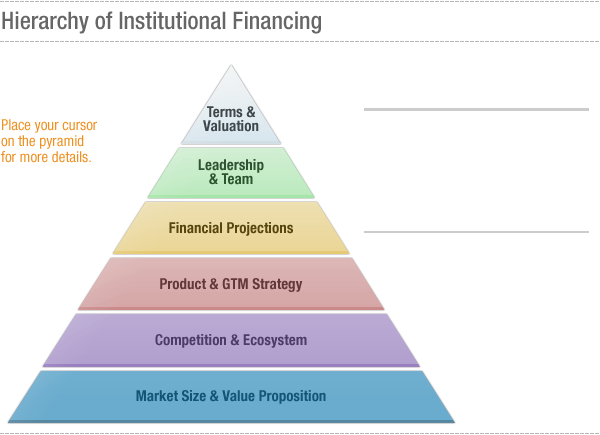 The Hierarchy of Institutional Financing Assessment is a proven business technique to determine the overall level of preparedness for a software company seeking angel or venture capital investment. It can also help identify business performance gaps or opportunities in preparation for future financing rounds. This quantitative methodology was developed by DaggerBoard Advisors based on years of direct experience and with input from leading angel investors, venture capital professionals and feedback from CEO's at hundreds of emerging software companies. The HIFin™ Funding Readiness Assessment is based on a personalized DaggerBoard review of your materials and business or investor pitch. The outcome report is a vital document that provides you with specific scores, feedback and suggestions across 6 key dimensions essential for funding and business improvement. The report also enables you to measure your company's position on each dimension relative to other emerging software companies. Potential gaps are identified and documented with an advisor that will provide you with specific actions needed before you embark on your (next) angel or venture funding process. Learn more about our Engagement Model. The addressable market being targeted, trends that impact the company in the particular market, and the applicability and power of the value proposition. The company's ability to establish, defend and differentiate both it's selling proposition and IP vs. competitors, and adjacent players and clearly define partnership opportunities and threats. The completeness of the product offering, technical validity, the customer adoption, go forward roadmap and go to market approach. The detailed assumptions and validation behind the revenue models and financial projections, as well as the match between funding expectations and requirements. The experience and completeness of the management team, board and advisors, as well as founders and CEO's compatibility with an outside investment. The valuation expectations relative to industry trends/norms, the suitability of the existing and future capital structure, as well as the likelihood for a liquidity event and tangible return.